Assistant manager Alan Knill feels the Cobblers can be more than a match for Bury this weekend despite the Shakers’ superb recent run of form. Town have lost two of their past three games while Bury have won six of their past seven outings and sit just four points outside of the automatic promotion places in Sky Bet League Two. All of which makes the Saturday meeting between the teams a very difficult assignment for Northampton, but one for which Knill is in bullish mood. “We can be a difficult team for anyone to play against and we’ve proved that this season,” said Knill, who is a former Bury manager and player. 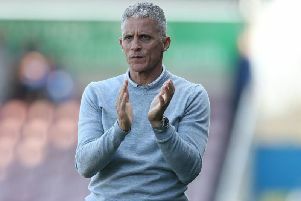 “Bury had their little dip a while ago but they’re back in form and they are probably about where they would have expected to be at this point of the season. “They’ve been there or thereabouts all season and they’ve hit form at exactly the right time. Northampton have actually scored seven goals more than their weekend opponents but Knill feels his players will need to pay special attention to the home side’s forward line. “They have good players all over the pitch but especially at the top end,” he said. “You just have to look at the fact that Ryan Lowe can’t even get in their side at the moment to know the quality that they’ve got.